Ottobot is the latest robotic toy to hit the UK market. He sings, he plays games and he tells jokes, but at just under £40 does he add anything to the continuous stream of so called interactive toys? In a word, yes! Ottobot is seven inches tall and responds to light, touch and sound (much like the rest of Tiger's interactive pets). but he does much more than this. On the top of Ottobot's head are four different coloured lights that form the basis of a copy cat game where you have to remember the sequence of flashing lights and repeat them. Leave Ottobot to walk around your house and he will happily wander around avoiding obstacles in his path - we set up a difficult assault course in the office and he managed it without any trouble. If you have £40 to spend then this is a purchase that will please almost any small child - and I dare say a large proportion of adults. 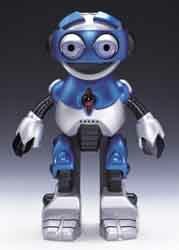 And if you own any of the other Tiger interactive toys then Ottobot will converse with them too! While he can be annoying, Ottobot comes complete with a handy on/off button that will save you reaching to rip out the battery when your little one tells you one too many Knock-Knock jokes. A worthy addition to any child's bedroom.